April 08, 18:23 UTC+3 KIEV. April 8. KIEV. April 8. /TASS/. Ukrainian presidential hopeful, leader of the Servant of the People political party Vladimir Zelensky was the preferred candidate across all age groups except for seniors over 60. At the same time, incumbent President Pyotr Poroshenko didn’t win over any age group, shows a poll conducted by the Ilko Kucheriv Democratic Initiatives foundation and the results of which were published on the organization’s website on Monday. According to the poll, 57% of respondents aged 18 to 29 voted for Zelensky in the first round of the elections, 14% supported the incumbent President, while 7% cast their votes for leader of the Batkivshchyna (Fatherland) Party Yulia Timoshenko. 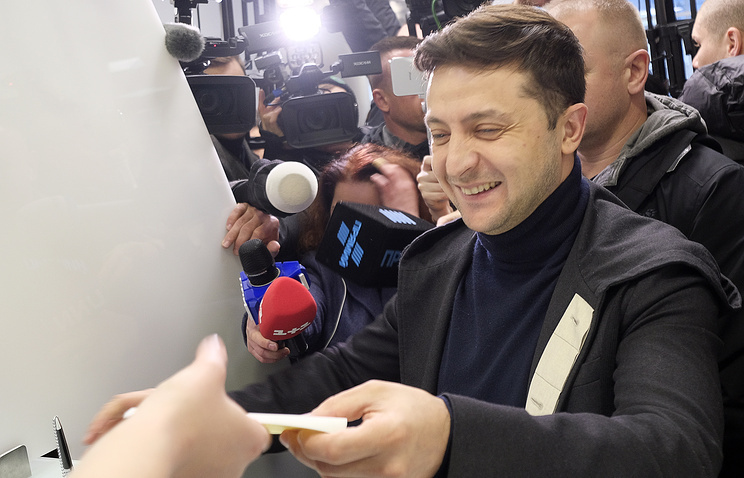 In the 30-39 age group, the majority also cast their ballots for Zelensky (45%). Poroshenko enjoyed 17% of support in this category, while Timoshenko was favored by 10% of the voters. Thirty-six percent of those surveyed aged 40 to 49 also supported the Servant of the People party candidate. Poroshenko and Timoshenko received 18.5% and 12% of the votes respectively in this age group. Zelensky was also the preferred candidate among voters aged 50 to 59 with 22% of the votes. Nineteen percent of the votes in this group were cast for Poroshenko, while 18% went to Timoshenko. In the oldest group, seniors aged over 60, 19% voted for Timoshenko, 18% for Poroshenko, and 17% of the votes were cast for the Opposition Platform - For Life party candidate Yuri Boiko, with Zelensky receiving only 12.5% of the votes. Last Sunday, the Ukrainian Central Election Commission (CEC) officially declared the results of the presidential elections’ first round that took place on March 31. The presidential hopeful from the Servant of the People political party Vladimir Zelensky racked up 30.24% of the votes, while incumbent President Pyotr Poroshenko came in second with 15.95%.